There's not much else to say about this chart. According to Gartner, the world spent $9.6 billion in tablets. 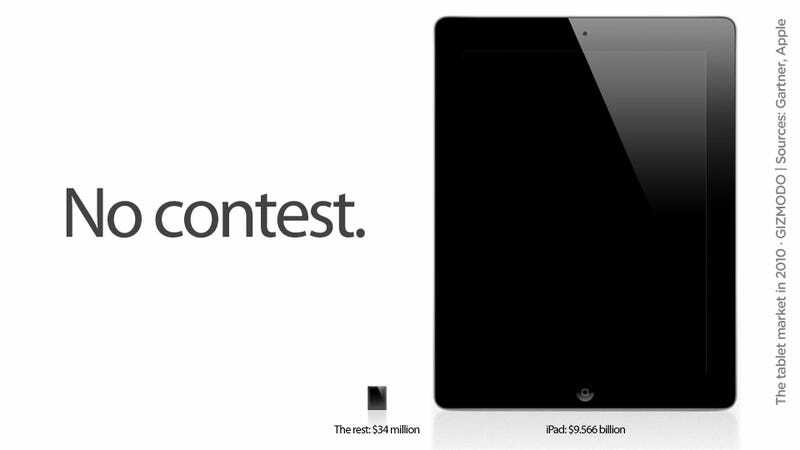 According to Apple's official numbers, the iPad got $9.566 billion. Of course, that's 2010. The real battle will be this year: Gartner says that the market will grow to $29.4 billion in 2011, cannibalizing PCs and getting into the enterprise in full force. But Honeycomb and Playbook fanboys, don't get your hopes too high: Gartner says that Apple will grab 70% of that market in 2011, and pretty much be the only game in town. Whatever. The only game in town I care about is Sword & Sworcery.